Emphasize the idea that a correlation between measurements does not imply a causal relationship (i.e., there needs to be other evidence to establish this relationship). More recent data available at: http://cdiac.ornl.gov/trends/co2/sio-keel.html] and especially [http://cdiac.ornl.gov/ftp/trends/co2/maunaloa.co2 for CO2 data. 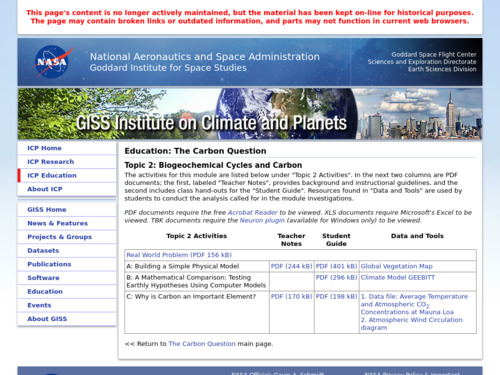 Further background materials and 8 other activities associated with this module are available at: http://icp.giss.nasa.gov/education. Data set in this exercise only goes to 1998. The educator may want to supplement this with more recent data, see links below or check the references in the educator's guide. Important learning about correlations and causation. This student graphing exercise allows students to interpret graphs, analyze data, and reach their own conclusions. Project/team approach to the lesson with computer-based graphing exercises, mind maps, and group discussions and presentations. Educator's guide is clearly written. Student materials are well organized. Complete activity, easy to use for educators and students.